Welcome to another blog post! I was invited to try out The Soap Factory a few weeks ago. I took Luke with me like I normally do... 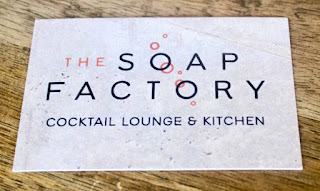 I thought that today I would talk to you guys about what I thought of the excellent establishment that is The Soap Factory. 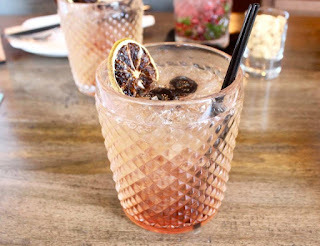 The Soap Factory is a cocktail bar and kitchen at Novotel Leeds Centre that creates high class cocktails and food that can be catered towards anyone. 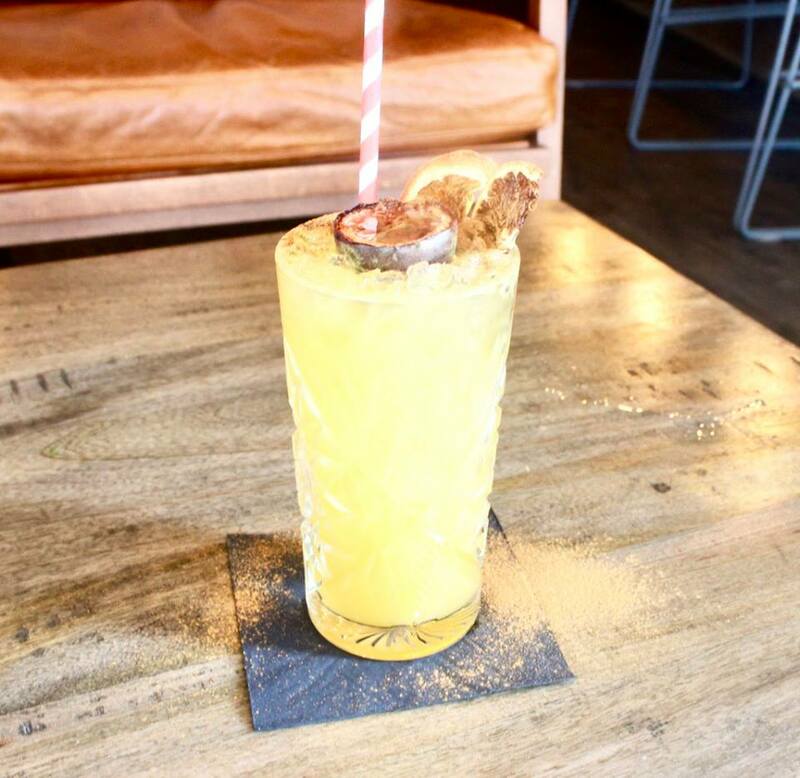 The Soap Factory also offer 2-4-1 cocktails and have started to offer an amazing afternoon tea including Prosecco and superb sweet treats such as Scones and Chocolate Cake. The wonderful cocktail bar and restaurant is located on Whitehall Road. 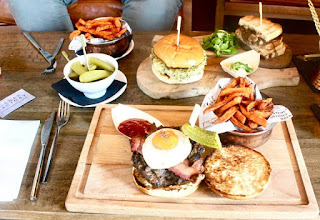 We started off our day in Leeds via going on an adventure to find the restaurant which after some time, we realised that it was only a stones throw away from Leeds Train Station. Once we had reached the glorious building, we decided to have a look around before heading into the building as the street looked amazing with grand glass and wonderful white buildings. We entered the building and made our way to a booth that consisted of two long rectangular leather couches and a long coffee table. We sat down and chatted for a minute before looking at the menus. We decided to start off with a cocktail. 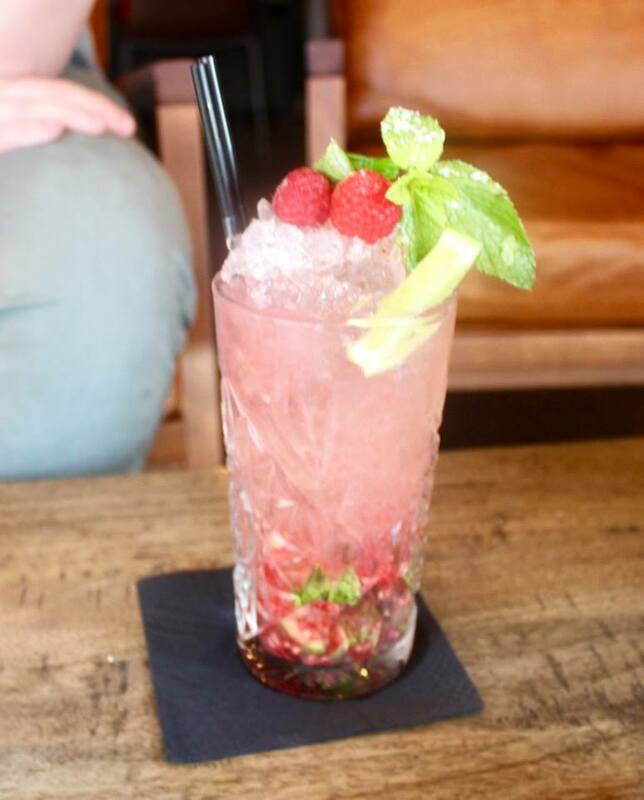 Luke decided to go for a Raspberry Mojito (which is available on their 2-4-1 offer) and I decided to start everything off with a good old Zombie because well I love a good Zombie! This one contained of different types of Rum, Pineapple & Citrus Juices and loads more. This cocktail is dusted with Cinnamon and is set on fire in front of you at your table! 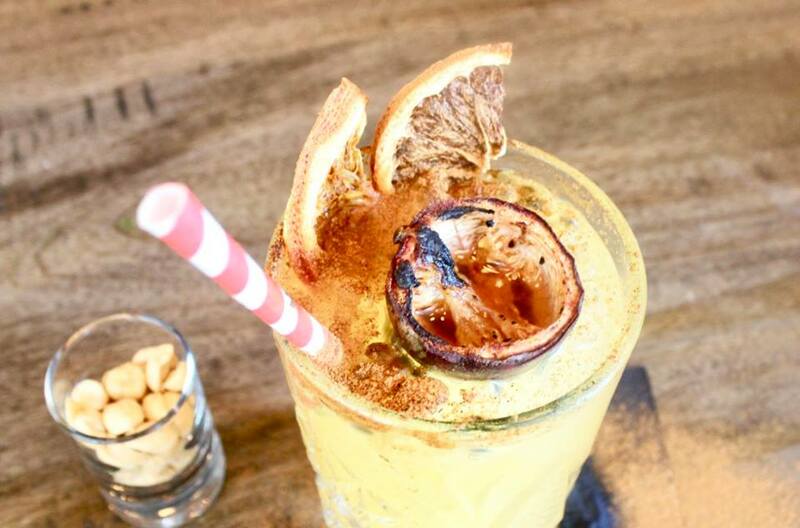 I love a Zombie but with the addition of Cinnamon, it was beyond delicious! A white landscape business card with The Soap Factory in big font and Cocktail Lounge and Kitchen in smaller black font on a light brown wood background. The starters come on a wooden slab and are served just like tapas. We ordered quite a few starters to share. 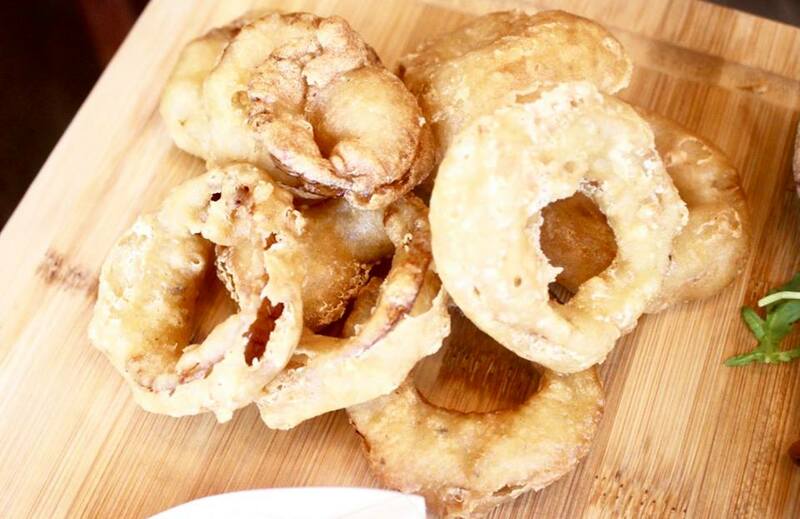 We ordered a Stack Of Onion Rings which were amazing as the batter had a slight spice to them but it was still very crispy. They'd definitely be great alongside a cold drink. The next starter was Thai Fishcakes with a Thai Sweet Chilli Mayo. The fishcakes were crispy on the outside and fluffy on the inside. Weirdly, the filling wasn't overly fishy. The Mayo was spicy but sweet which went well with the Zesty Fishcakes. Next on the board was Sweetcorn Fritters, the best way to thinkof these little beauties are like sweetcorn studded pancakes. I love Sweetcorn so I instantly loved these. The contrast between the smooth batter and the slight crunch from the corn was fantastic! These fritters came with a Saffron Yoghurt which I adored as the dip wasn't too creamy nor spicy. Just a wonderful hit of both! We then ate Garam Garam Pakoras which came with a wonderful Raita. I love Pakoras no matter what and I loved these! The crunchy outside agaiinst the slightly spiced insides was fabulous especially when paired with the cool Raita. These on their own with a cold Beer would be amazing. Last but definitely not least were the Sweet & Sticky Baby Sausages which were coated in Honey and Wholegrain Mustard. I could eat a billion of these over and over again. I loved the taste of these slightly spiced sausages and as they were small you could pop a lot of them in your mouth without realising or counting how many you actually ate. The Honey and Wholegrain Mustard glaze ensured that the Sausages were sticky but at the same time had a warm heat to it. 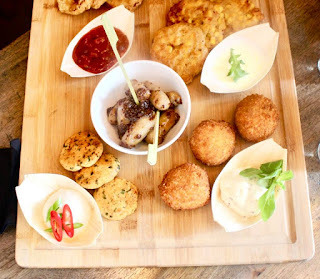 A mixture of starters dotted about on a wooden board. We then ordered another drink to cleanse the palate. Luke had another Mojito whilst I tried a Jack Daniels based cocktail with Maple Syrup. I love Jack Daniels and the addition of Maple Syrup just made it that little bit sweeter. I'd love to drink this on a warm Summers day. We then ordered a few mains to try out. The first one that I tried was Posh Pot Noodles which are a glass jar filled with noodles and other goodies and a vessel containing Miso Broth. When it comes to the table, you get to pour the broth into the noodles to create your own dish. I chose Beef and Mushroom. I know that Mushrooms have a controversia reputation but I like them sometimes! I loved the texture of Steak against the soft Noodes. I also loved the slight heat from the Miso Broth. Luke had a Chicken one and loved it but wasn't completely keen of the noodles. We then tried a Steak Bomb Sandwich which contains Grilled Steak, Caramelised Onions and Mustard Mayo served on a rustic Ciabatta. I loved the soft Steak against the crunchy Ciabatta. I love Mustard and Steak. I think that this would be amazing for a lunch with friends. We then got another drink. This time, myself and Luke decided to try a Lychee Mojito which reminded me of a Mojito with a floral undertone. I love Lychee in many different forms so I instantly loved this cocktail. I think that it would be a great drink to sit outside with when the sun is going down. We then tried The Soap Factory's Burgers. 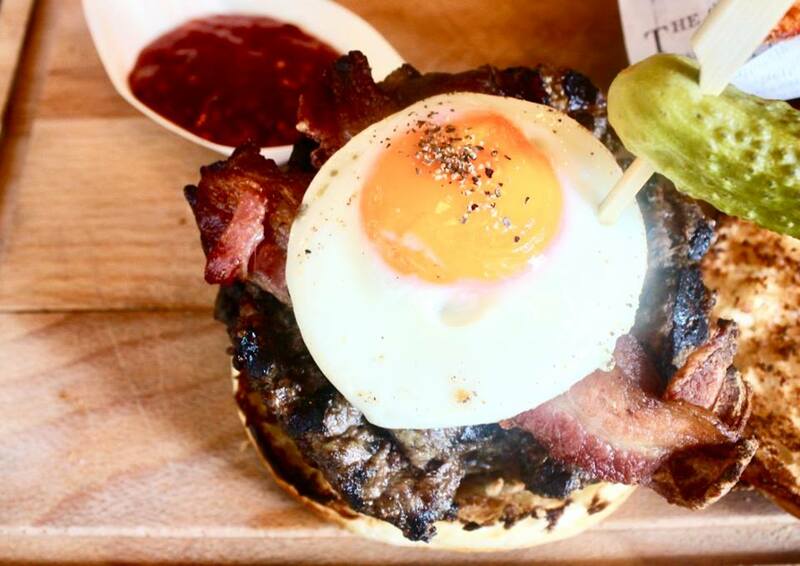 I tried their signature burger which is dubbed Soapy Joe. 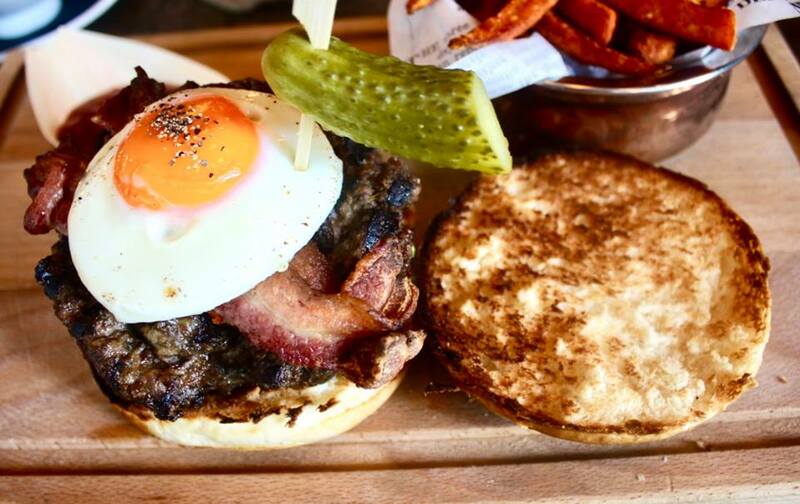 Soapy Joe contains two Beef Burgers, Smoked Bacon, Mature Yorkshire Cheddar, Fried Onions, Gherkins, a Fried Hens Egg, Lettuce, Tomato, Onion and House Relish in a Brioche Bun. I loved this burger! The patties were juicy and were spiked with Black Pepper. I loved the texture of the oozing yok against the beef patties. 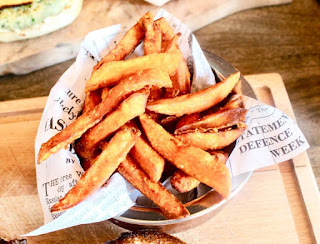 I also got Sweet Potato Fries with these which were amazing! Sweet but crunchy! 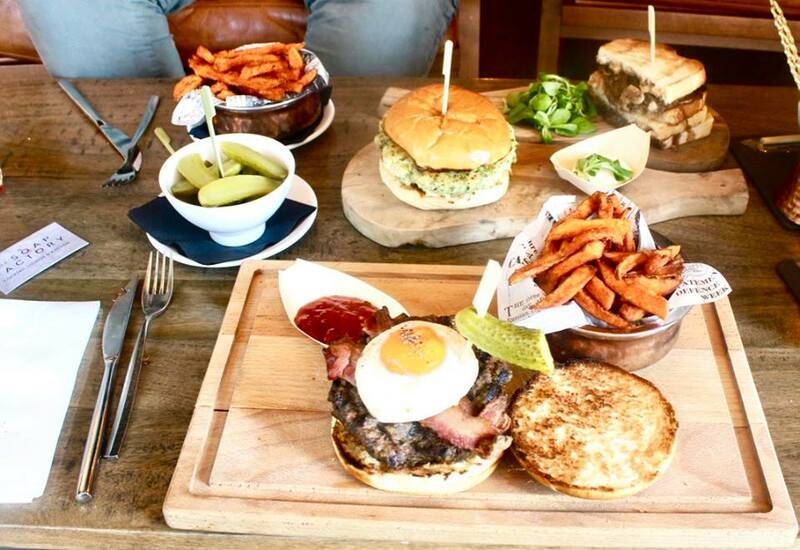 Both Burgers, fries, pickles and sandwich on a rectangular light wooden board. Luke had a East Coast Burger which I had a taste of. This dish contained a Thai Fish Burger with Coriander, Chili and Lime with Mayo in a Brioche Bun. I loved this one as it screamed Summer in a bun! 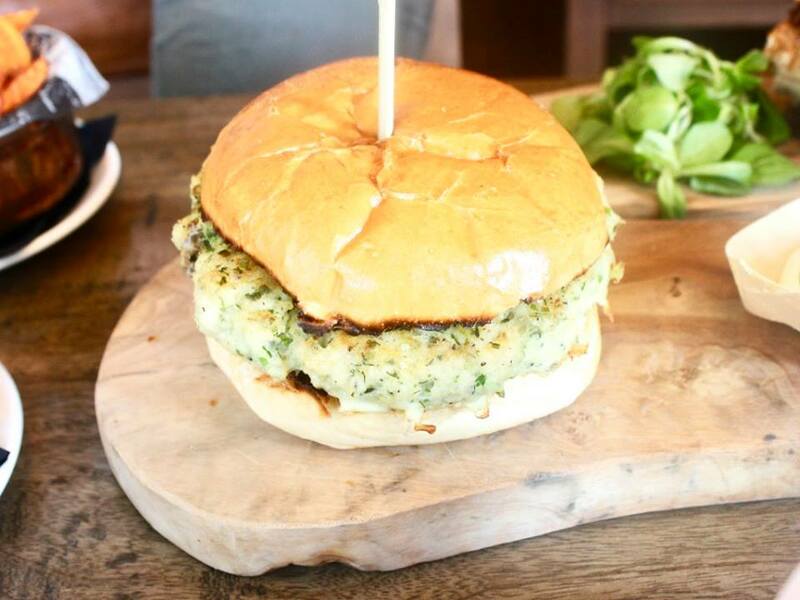 I loved the Fish Burger with the acidity of the Lime and the freshness of the Coriander. So good! We looked at the desserts but due to being so full, we thought that it would be best to not have a dessert and come back in our own time if we wanted to try a dessert! We drank up and decided to head back to the train station. 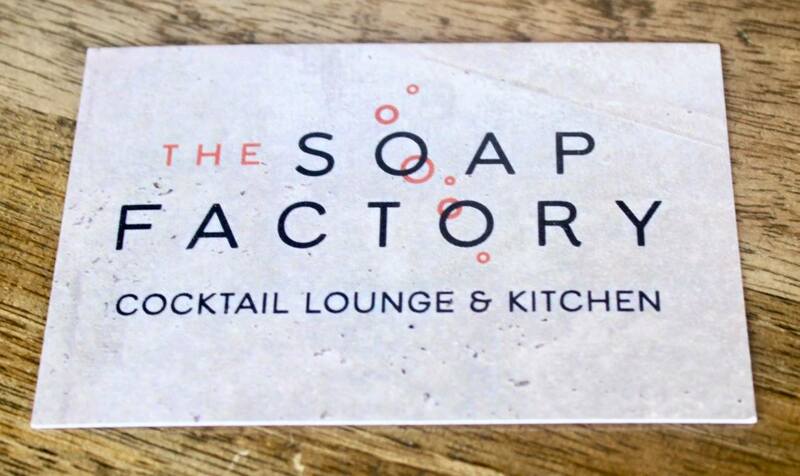 Have you been to The Soap Factory before? Let me know down below! Thanks to the staff at The Soap Factory for inviting us down and making amazing food for us to enjoy and talk about. Check out their Twitter here. 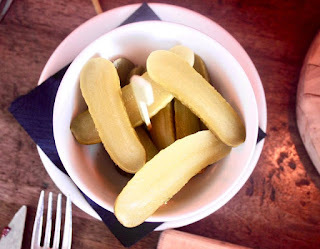 I hope that you've enjoyed this food based blog post and I hope that you come back next time for another blog post! This blog post was in return of food and drinks. All opinions, views and ramblings are my own.